The 4 Moncler Simone Rocha line, collection n°4 of the Moncler Genius project, imagines a woman who enjoys one the most romantic of hobbies, gardening in beautiful English countryside. 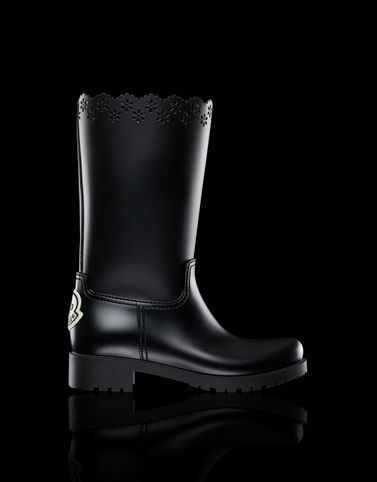 This is what inspired the Rebekah, a rainboot which is not afraid to brave any weather conditions with a single objective: to add a touch of femininity even in the pouring rain. To protect your purchase over time, we recommend the shoes be cleaned using a brush with soft natural bristles or a slightly damp soft cloth. Before cleaning, make sure that the shoes are completely dry. After brushing, apply an appropriate amount of cleaning product to the leather and create small circular motions with a soft dry cloth. For suede shoes, please use a special rubber brush. We also recommend the use of a suitable water-repellent product before wearing the shoes in wet conditions. Dry away from direct heat. Finish the cleaning using a dry clean cloth. Store in the felt bag provided at the time of purchase.